This Spring many parts of the country have been clobbered by freakishly heavy rains causing extensive flooding. It’s estimated that this year’s crop of flood damaged cars and trucks will exceed the number Super Storm Sandy caused back in 2012. That’s a lot of flooded cars! With just about all parts of the country susceptible to flooding, including drought stricken California, would you know what to do if you found fish swimming on your floorboard? 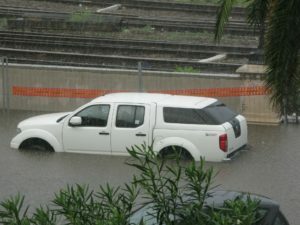 Are flood damaged cars automatic totals? Is it even worth trying to repair a flood damaged car? Is it possible to sell a flood damaged car with a regular title? The damage may be covered by insurance. Your collision coverage will not cover the damage but if you have comprehensive (commonly called fire and theft) then you may have coverage for flooding. Check your policy and if you are covered call your insurance company’s claims department right away. Odds are you won’t see an adjuster for days because everyone else with flood damaged vehicles will be filing claims at the same time however, knowing you have coverage will allow you to make decisions about what to do next. If the high water mark is at the dash you probably have a totaled car. Even cars that are ten years old have tons of sensitive electronics that control or manage almost every mechanical aspect of your vehicle. The connections will corrode almost immediately meaning the entire electrical system will have to be replaced. Most insurance companies will consider a car that is submerged to the dash a total. Don’t try to start the engine. If the high water mark is above the exhaust pipe, water may have found its way into a cylinder and if you try to start the vehicle you may cause a hydro lock. Water will not compress the same way air does and if it’s forced into the firing chamber it will most likely create a vacuum lock freezing the cylinder. Have a mechanic check out the engine before you crank it up. Do try to dry out the vehicle. You can anticipate replacing anything covered with fabric including carpets, seats, and door panels and if you can remove them you should. Even if you can’t get them out you should make every effort to dry out the interior and trunk with towels and fans to prevent the formation of mold. Mold will eat almost anything including cloth and carpet and the only way to prevent it from forming is to deny it moisture. Check the oil and air filter. If you see a drop of water on the dip stick or any sign of moisture on the air filter you definitely do not want to start the engine. Have a mechanic check it out. If there is water in the oil or on the filter you can almost bet there is water in the engine. If your car was seriously damaged then it will be totaled by the insurance company. Of course this means you’ll need a replacement and if you are looking to buy used you want to make absolutely certain you aren’t buying somebody else’s flood damaged vehicle. When the insurance company pays you they take your car and auction it off. Unscrupulous dealers will buy the car, get it in running condition and then resell it. Check the title of any car you’re buying for the words “salvage” or “flood damage” and if you see them just walk away. Actually the best way to ensure you are not buying a salvaged car is to use a title checking service like CarFax to see the history of the vehicle including any salvaged titles issued. Here’s hoping you never have to go through this process but if you do we hope we offered some helpful advice. For more tips on all things automotive check out the blog at IQ Auto Buyer.